The Tampa Bay Rays head to Kauffman Stadium on Tuesday, August 29, 2017 to take on the Kansas City Royals. The expected starting pitchers are Alex Cobb for the Rays and Jake Junis for the Royals. The odds for this matchup have Tampa Bay at -113 and Kansas City at +103. The Rays have a 66-63-3 over/under mark and a 64-68-0 run line record. The Royals are 62-67-0 against the run line and have a 60-63-6 over/under record. The Rays have a 65-67 overall record this season. Starting pitcher Alex Cobb has a 9-8 record with an earned run average of 3.69 and a WHIP of 1.22. He has 101 strikeouts over his 151.1 innings pitched and he's given up 146 hits. He allows 8.7 hits per 9 innings and he has a FIP of 4.21. The bullpen has an earned run average of 4.04 and they have given up 377 base hits on the year. Teams are hitting .234 against the bullpen and they've struck out 378 hitters and walked 161 batters. As a team, Tampa Bay allows 8.3 hits per nine innings while striking out 8.2 batters per nine innings. They are 8th in the league in team earned run average at 4.05. The Rays pitchers collectively have given up 1,087 base hits and 530 earned runs. They have allowed 160 home runs this season, ranking them 16th in the league. Tampa Bay as a pitching staff has walked 417 batters and struck out 1,074. They have walked 3.2 men per 9 innings while striking out 8.2 per 9. They have a team WHIP of 1.28 and their FIP as a unit is 4.24. As a team Tampa Bay is hitting .246, good for 24th in the league. 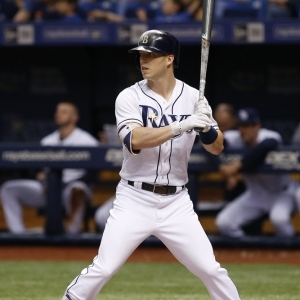 The Rays hold a .425 team slugging percentage and an on-base percentage of .320, which is good for 19th in baseball. They rank 24th in MLB with 8.4 hits per game. Logan Morrison is hitting .244 with an on-base percentage of .350. He has 104 hits this season in 426 at bats with 70 runs batted in. He has a slugging percentage of .512 and an OPS+ of 132. Corey Dickerson is hitting .291 this year and he has an on-base percentage of .338. He has totaled 146 hits and he has driven in 58 men in 501 at bats. His OPS+ is 128 while his slugging percentage is at .513. The Rays have 1,103 hits, including 193 doubles and 185 home runs. Tampa Bay has walked 458 times so far this season and they have struck out 1,269 times as a unit. They have left 928 men on base and have a team OPS of .745. They score 4.29 runs per contest and have scored a total of 566 runs this year. Kansas City has a 64-65 overall mark this year. With an earned run average of 4.68, Jake Junis has a 5-2 record and a 1.37 WHIP. He has 49 strikeouts over the 57.2 innings he's pitched. He's also given up 61 hits. He allows 9.5 hits per nine innings and his FIP stands at 4.98. The bullpen has an earned run average of 4.09 and they have given up 429 base hits on the year. Teams are hitting .251 against the Royals bullpen. Their relievers have struck out 400 batters and walked 184 opposing hitters. As a team, Kansas City allows 9.1 hits per nine innings while striking out 7.7 batters per nine innings. They are 15th in the league in team earned run average at 4.46. The Royals pitchers as a team have surrendered 1,165 base knocks and 569 earned runs this season. They have given up 152 home runs this year, which ranks 22nd in Major League Baseball. Kansas City as a staff has walked 409 hitters and struck out 986 batters. They give up a walk 3.2 times per 9 innings while they strike out 7.7 per 9. Their team WHIP is 1.37 while their FIP as a staff is 4.30. As a team, they are batting .257, good for 13th in the league. The Royals hold a .418 team slugging percentage and an on-base percentage of .310, which is good for 28th in baseball. They rank 12th in MLB with 8.8 hits per contest. Lorenzo Cain comes into this matchup batting .288 with an OBP of .350. He has 138 hits this year along with 41 RBI in 479 AB's. He maintains a slugging percentage of .430 with an OPS+ of 104. Eric Hosmer is hitting .320 this season and he has an OBP of .384. He has collected 157 hits in 490 at bats while driving in 73 runs. He has an OPS+ of 131 and a slugging percentage of .502. The Royals as a unit have 1,138 base hits, including 200 doubles and 157 homers. Kansas City has walked 314 times this year and they have struck out on 961 occasions. They have had 814 men left on base and have an OPS of .728. They have scored 4.34 runs per game and totaled 560 runs this season. Who will win tonight's Rays/Royals MLB game against the spread?